Anglo, Sydney, The Martial Arts of Renaissance Europe (Yale University Press, 2000). Campbell, Joseph, The Hero with a Thousand Faces (MJF Books, 1996); The Masks of God, in four volumes: Primitive Mythology, Oriental Mythology, Occidental Mythology, Creative Mythology (Arkana, 1991). Cotterell, Brian, and Kamminga, Johan, Mechanics of Pre-industrial Technology: An Introduction to the Mechanics of Ancient and Traditional Material Culture (Cambridge University Press, 1990). Daniels, Peter T., and Bright, William, The World's Writing Systems (Oxford University Press, 1996). de Camp, L. Sprague, The Ancient Engineers (Ballantine, 1963). Diamond, Jared, Guns, Germs, and Steel (Norton, 1997). Dixon, R.M.W., The Rise and Fall of Languages (Cambridge University Press, 1997). Graves, Robert, The White Goddess: A Historical Grammar of Poetic Myth, Amended and Enlarged Edition (Octagon, 1972). Guadalupi, Gianni, and Manguel, Alberto, The Dictionary of Imaginary Places (Macmillan, 1980). Jaynes, Julian, The Origin of Consciousness in the Breakdown of the Bicameral Mind (Houghton Mifflin, 1990). Keegan, John, The Face of Battle (Penguin, 1978). Carter, Lin, Imaginary Worlds (Ballantine, 1973). Clute, John, and Grant, John, The Encyclopedia of Fantasy (St. Martin's Griffin, 1999). Fonstad, Karen Wynn, The Atlas of Middle-Earth, revised edition (Houghton Mifflin, 1991). Arguably this ought to go under "Factual Information," as it's a serious scholarly reference work about geography – it just happens to be the geography of Middle-Earth. One of the best models for extracting a detailed description of a setting from a work of fiction. Hume, Kathryn, Fantasy and Mimesis: Responses to Reality in Western Literature (Routledge, 1985). Irwin, Robert, The Arabian Nights: A Companion (Allen Lane, 1994). Jones, Diana Wynne, The Tough Guide to Fantasyland (Vista, 1996). Le Guin, Ursula K., "From Elfland to Poughkeepsie," in The Language of the Night (HarperCollins, 1992). Tolkien, J.R.R., "On Fairy Stories," in Poems and Stories (Houghton Mifflin, 1994). Also available in The Tolkien Reader (Ballantine, 1966). Alighieri, Dante, The Divine Comedy (New American Library, 2003). Barrie, J.M., Peter Pan (Viking, 1991). Baum, L. Frank, The Wizard of Oz, The Land of Oz, Ozma of Oz, The Emerald City of Oz, Glinda of Oz, and others in the Oz series. The complete series has been reprinted by Dover Publications. Cabell, James Branch, Figures of Earth (Wildside Press, 2001), The Silver Stallion (Del Rey, 1979), and Jurgen (Dover, 1978). Carroll, Lewis, Alice in Wonderland, Through the Looking-Glass and What Alice Found There (omnibus edition, Norton, 1999), and The Hunting of the Snark (Norton, 2006). Both of these volumes have been annotated by Martin Gardner. Chaucer, Geoffrey, The Canterbury Tales (Penguin, 2003). Coleridge, Samuel Taylor, "The Rime of the Ancient Mariner," in The Complete Poems (Penguin, 1997). Dunsany, Lord, The King of Elfland's Daughter (Del Rey, 1999) and Time and the Gods (Kessinger, 2004). Goethe, Johann Wolfgang, Faust (Princeton University Press, 1994). Haggard, H. Rider, She (Oxford University Press, 1998). Hesiod, Theogony (Ann Arbor Paperbacks, 1991). Hesse, Hermann, Steppenwolf (Picador, 2002). Homer, The Odyssey (Penguin, 1999). Kingsley, Charles, The Water-Babies (J.M. Dent & Sons, 1983). Kipling, Rudyard, "The Brushwood Boy" in The Day's Work (Fredonia, 2000), Puck of Pook's Hill (Blue Unicorn, 1998), and Rewards and Fairies (Kessinger, 2004). Kouyaté, Mamadou, Sundiata (Longman, 1995). MacDonald, George, "The Light Princess" in The Complete Fairy Tales (Penguin, 1999), The Princess and the Goblin (Puffin, 1997), and The Princess and Curdie (Puffin, 1996). Malory, Thomas, Le Morte d'Arthur (Signet, 2001). Maeterlinck, Maurice, The Blue Bird (Kessinger, 2004). Nesbitt, E., Five Children and It (Puffin, 1996) and The Phoenix and the Carpet (Puffin, 1996). The Saga of the Volsungs (University of California Press, 1990). Shakespeare, William, A Midsummer Night's Dream and The Tempest (both Signet, 1998). Vālmīki, The Rāmāyaṇa (Penguin, 1998). Virgil, The Aeneid (Vintage, 1990). Vyasa, The Mahabharata (University of Chicago Press, 2000). Alexander, Lloyd, The Book of Three (Holt, 1964); The Black Cauldron (Holt, 1965); The Castle of Llyr (Holt, 1966); Taran Wanderer (Holt, 1967); The High King (Holt, 1968). Anderson, Poul, Operation Chaos (Doubleday, 1971) and Three Hearts and Three Lions (Doubleday, 1961). Beagle, Peter S., The Last Unicorn (Ballantine, 1968). Bellairs, John, The Face in the Frost (Ace, 1978). Blish, James, Black Easter (Doubleday, 1968) and The Day After Judgment (Doubleday, 1971) [reissued in one volume as The Devil's Day (Baen, 1990)]. Borges, Jorge Luis, Labyrinths, edited by James E. Irby and Donald A. Yates (New Directions, 1988). Brust, Steven, Jhereg (Ace, 1983) and The Phoenix Guards (Tor, 1991), Five Hundred Years After (Tor, 1994), The Paths of the Dead (Tor, 2002), and The Lord of Castle Black (Tor, 2003). Bujold, Lois McMaster, The Curse of Chalion (Eos, 2001) and Paladin of Souls (Eos, 2003). Bull, Emma, War for the Oaks (Orb, 2001). Card, Orson Scott, Seventh Son (T. Doherty Associates, 1987). Carey, Jacqueline, Kushiel's Dart (Tor, 2001); Kushiel's Chosen (Tor, 2002); Kushiel's Avatar (Tor, 2003); Kushiel's Scion (Grand Central, 2006); Kushiel's Justice (Grand Central, 2007); Kushiel's Mercy (Grand Central, 2008); Naamah's Kiss (Grand Central, 2009); Naamah's Curse (Grand Central, 2010); and Naamah's Blessing (Grand Central, 2011). Cherryh, C.J., Rusalka (Del Rey, 1989). Cook, Glen, "Black Company" series: The Black Company (Tor, 1984); Shadows Linger (Tor, 1984); The White Rose (Tor, 1985); Shadow Games (Tor, 1989); The Silver Spike (Tor, 1989); Dreams of Steel (Tor, 1990); Bleak Seasons (Tor, 1996); She Is The Darkness (Tor, 1998); Water Sleeps (Tor, 1999); and Soldiers Live (Tor, 2000). Cook, Glen, "Garrett, P.I." series: Sweet Silver Blues (Signet, 1987); Bitter Gold Hearts (Signet, 1988); Cold Copper Tears (Signet, 1988); Old Tin Sorrows (Signet, 1989); Dread Brass Shadows (Roc, 1990); Red Iron Nights (Roc, 1991); Deadly Quicksilver Lies (Roc, 1994); Petty Pewter Gods (Roc, 1995); Faded Steel Heat (Roc, 1999); Angry Lead Skies (Roc, 2002); Whispering Nickel Idols (Roc, 2005); Cruel Zinc Melodies (Roc, 2008); Gilded Latten Bones (Roc, 2010); and Wicked Bronze Ambition (Roc, 2013). These are gradually being collected into three-in-one omnibus volumes: Introducing Garrett, P.I. (Roc, 2011), Garrett Takes the Case (Roc, 2012), and Garrett for Hire (Roc, 2013). Crowley, John, Little, Big (Bantam, 1981). Davidson, Avram, The Adventures of Doctor Esterhazy (Owlswick, 1991). de Camp, L. Sprague, and Pratt, Fletcher, The Compleat Enchanter (Doubleday, 1975). De Lint, Charles, Moonheart (Ace, 1984). Donaldson, Stephen R., Lord Foul's Bane (Del Rey, 1977), The Illearth War (Del Rey, 1977), The Power That Preserves (Del Rey, 1977). Eager, Edward, Half Magic, Knight's Castle, Magic by the Lake, The Time Garden, and Seven-Day Magic. The first four are also available as a boxed set. Eddison, E.R., Mistress of Mistresses: A Vision of Zimiamvia (Dutton, 1935); A Fish Dinner in Memison (Dutton, 1941); The Mezentian Gate (Elek Books, 1958) [reissued in one volume as Zimiamvia]. The Mezentian Gate was published in incomplete form long after Eddison's death in 1945. Effinger, George Alec, Maureen Birnbaum, Barbarian Swordsperson (Swan Press, 1993). Ford, John M., The Dragon Waiting (Timescape Books, 1983). Gaiman, Neil, and Pratchett, Terry, Good Omens: The Nice and Accurate Prophecies of Agnes Nutter, Witch (Workman, 1990). Garfinkle, Richard, Celestial Matters (Tor, 1996). Garner, Alan, The Weirdstone of Brisingamen: A Tale of Alderley (Random House, 1969) and The Moon of Gomrath: A Tale of Alderley (HarperCollins, 1983). Garrett, Randall, Lord Darcy Investigates (Ace, 1981), Murder and Magic (Ace, 1981), and Too Many Magicians (Ace, 1979) [reissued in one volume as Lord Darcy (Baen, 2002)]. Gentle, Mary, The Book of Ash (Eos, 1999-2000). Hamilton, Laurell K. A Kiss of Shadows (Del Rey, 2000), A Caress of Twilight (Ballantine, 2002), Seduced by Moonlight (Ballantine, 2004), A Stroke of Midnight (Ballantine, 2005), Mistral's Kiss (Ballantine, 2006), A Lick of Frost (Ballantine, 2007), Swallowing Darkness (Ballantine, 2008), Divine Misdemeanors (Ballantine, 2009), and A Shiver of Light (Berkley, 2014). Heinlein, Robert, "Magic Inc.," in Waldo & Magic, Inc. (Doubleday, 1950) and "The Unpleasant Profession of Jonathan Hoag," in The Unpleasant Profession of Jonathan Hoag (Gnome, 1959) [reissued in one volume as The Fantasies of Robert A. Heinlein (Tor, 1999)]. Holdstock, Robert, Mythago Wood (Gollancz, 1984), Lavondyss (Gollancz, 1988), The Hollowing (Harper Collins, 1993). Howard, Robert Ervin, Conan the Barbarian (Gnome Press, 1954), and Conan the Conqueror: The Hyborian Age (Gnome Press, 1950). The three-volume Wandering Star/Del Rey Conan of Cimmeria set is easier to find and restores the original text: The Coming of Conan the Cimmerian (2003), The Bloody Crown of Conan (2004), and The Conquering Sword of Conan (2005). Hughart, Barry, Bridge of Birds (St. Martin's, 1984), The Story of the Stone (Doubleday, 1988), and Eight Skilled Gentlemen (Doubleday, 1991). Jackson, Melanie, Traveler (Love Spell, 2003). Karr, Phyllis Ann, The Idylls of the Queen (Berkley, 1985). L'Engle, Madeleine, A Wrinkle in Time (Ariel, 1962), A Wind in the Door (Farrar, Straus and Giroux, 1973), A Swiftly Tilting Planet (Farrar, Straus and Giroux, 1978), Many Waters (Farrar, Straus and Giroux, 1986), and An Acceptable Time (Farrar, Straus and Giroux, 1989). Le Guin, Ursula K., "The Rule of Names," in The Wind's Twelve Quarters (HarperCollins, 1975), A Wizard of Earthsea (Parnassus, 1968), The Tombs of Atuan (Atheneum, 1971), and The Farthest Shore (Atheneum, 1972). Lee, Tanith, Night's Master (DAW, 1978), Death's Master (New American Library, 1986), Delusion's Master (DAW, 1987), Delirium's Mistress (New American Library, 1986), and Night's Sorceries (DAW, 1987). Leiber, Fritz, Conjure Wife (Gregg Press, 1977), Swords and Deviltry (Gregg Press, 1977), Swords Against Death (Gregg Press, 1977), Swords in the Mist (Gregg Press, 1977), Swords Against Wizardry (Gregg Press, 1977), The Swords of Lankhmar (Gregg Press, 1977), Swords and Ice Magic (Gregg Press, 1977), and Our Lady of Darkness (Berkley, 1977). Lewis, C.S., Out of the Silent Planet (Avon, 1949), Perelandra (Macmillan, 1944), and That Hideous Strength (Macmillan, 1946). Lovecraft, H.P., "The Dream-Quest of Unknown Kadath," in Beyond the Wall of Sleep (Arkham House, 1943) [also collected in Dreams of Terror and Death: The Dream Cycle of H.P. Lovecraft (Del Rey, 1995)]. MacAvoy, Roberta, The Grey Horse (Bantam, 1987), and Tea with the Black Dragon (Bantam, 1983). McKillip, Patricia, The Riddle-Master of Hed (Ballantine, 1977). Miéville, China, Perdido Street Station (Del Rey, 2001) and The Scar (Ballantine, 2002). Moon, Elizabeth, Sheepfarmer's Daughter (Baen, 1988), Divided Allegiance (Baen, 1988), and Oath of Gold (Baen, 1989). The trilogy is also available as an omnibus, The Deed of Paksenarrion (Baen, 1992). Moorcock, Michael, Elric of Melnibone (DAW, 1976), Sailor on the Seas of Fate (DAW, 1976), Weird of the White Wolf (DAW, 1977), The Vanishing Tower (DAW, 1977), Bane of the Black Sword (DAW, 1977), and Stormbringer (DAW, 1977). Moore, C.L., Jirel of Joiry (Ace, 1996). Murphy, Pat, Nadya: The Wolf Chronicles (Tor, 1996). Niven, Larry, The Magic Goes Away (Ace, 1978). Nix, Garth, Sabriel (HarperCollins, 1995); Lirael, Daughter of the Clayr (HarperCollins, 2001); Abhorsen (HarperCollins, 2003). Owens, Robin, Heart Mate (Jove, 2001), Heart Thief (Berkley, 2003), and Heart Duel (Berkley, 2004). Peake, Mervyn, Titus Groan (Ballantine, 1968), Gormenghast (Ballantine, 1968), and Titus Alone (Ballantine, 1968) [reissued in one volume as The Gormenghast Novels (Overlook Press, 1995)]. Powers, Tim, The Anubis Gates (Ace, 1984), Declare (William Morrow, 2001), The Drawing of the Dark (Ballantine, 1979), On Stranger Tides (Ace, 1987), The Stress of Her Regard (Ace, 1989). Pratchett, Terry, the Discworld series. Rawn, Melanie, The Ruins of Ambrai (Daw, 1994) and The Mageborn Traitor (Daw, 1997). A third volume, The Captal's Tower, may be forthcoming, but no release date has been set. Robinson, Kim Stanley, The Years of Rice and Salt (Bantam, 2002). Rowling, J.K., Harry Potter and the Sorcerer's Stone (A.A. Levine, 1998), Harry Potter and the Chamber of Secrets (A.A. Levine, 1999), Harry Potter and the Prisoner of Azkaban (A.A. Levine, 1999), Harry Potter and the Goblet of Fire (A.A. Levine, 2000), Harry Potter and the Order of the Phoenix (A.A. Levine, 2003), Harry Potter and the Half-Blood Prince (A.A. Levine, 2005), and Harry Potter and the Deathly Hallows (A.A. Levine, 2007). Scott, Melissa, Five-Twelfths of Heaven (Baen, 1985), Silence in Solitude (Baen, 1986), and The Empress of Earth (Baen, 1987). Smith, Thorne, The Night Life of the Gods (Doubleday, 1931), and Topper (McBride, 1926). Swann, Thomas Burnett, Wolfwinter (Ballantine, 1972). Swanwick, Michael, The Iron Dragon's Daughter (Avon, 1994). Tolkien, J.R.R., The Hobbit (Houghton Mifflin, 1938) and The Lord of the Rings (Houghton Mifflin, 1954). Turtledove, Harry, Between the Rivers (Tor, 1998) and The Case of the Toxic Spell Dump (Baen, 1993). Vance, Jack, Madouc (Ace, 1990), Lyonesse (Berkley, 1983), The Green Pearl (Berkley, 1986), The Dying Earth (Underwood-Miller, 1994), The Eyes of the Overworld (1966), Cugel's Saga (1983), and Rhialto the Marvellous (1984). White, T.H., The Once and Future King (Putnam, 1958). Williams, Walter Jon, Metropolitan (HarperPrism, 1995) and City on Fire (HarperPrism, 1997). Williamson, Jack, Darker than You Think (Fantasy Press, 1948). Windling, Terri, and Sherman, Delia, The Essential Bordertown (Tor, 1998). Zelazny, Roger, The Chronicles of Amber, containing Nine Princes in Amber (Doubleday, 1970), The Guns of Avalon (Doubleday, 1972), Sign of the Unicorn (Doubleday, 1975), The Hand of Oberon (Doubleday, 1976), and The Courts of Chaos (Doubleday, 1978) [reissued in expanded form as The Great Book of Amber, The Complete Amber Chronicles 1-10 (Eos, 1999)]. The Adventures of Baron Munchausen (Terry Gilliam, 1988). Beauty and the Beast [La Belle et la bête] (Jean Cocteau, 1946). Bell, Book, and Candle (Richard Quine, 1958). Big Trouble in Little China (John Carpenter, 1986). Clash of the Titans (Desmond Davis, 1981). Crouching Tiger, Hidden Dragon [Wo Hu Cang Long] (Ang Lee, 2000). The Golden Voyage of Sinbad (Gordon Hessler, 1973). The Hobbit: An Unexpected Journey (Peter Jackson, 2012); The Desolation of Smaug (Peter Jackson, 2013); and The Battle of the Five Armies (Peter Jackson, 2014). Extended versions of the first and second movies are also available. Jason and the Argonauts (Don Chaffey, 1963). The Last Unicorn (Jules Bass, Arthur Rankin, Jr., 1982). Animated. The Lord of the Rings: The Fellowship of the Ring (Peter Jackson, 2001); The Two Towers (Peter Jackson, 2002); and The Return of the King (Peter Jackson, 2003). Extended versions of all three movies are available in a boxed set. The Matrix (Andy Wachowski and Larry Wachowski, 1999), The Matrix Reloaded (Andy Wachowski and Larry Wachowki, 2003), The Matrix Revolutions (Andy Wachowski and Larry Wachowski, 2003), boxed set. A Midsummer Night's Dream (Michael Hoffman, 1999). Monty Python and the Holy Grail (Terry Gilliam, Terry Jones, 1975). The Princess Bride (Rob Reiner, 1987). Princess Mononoke [Mononoke Hime] (Hayao Miyazaki, 1997). Animated. Prospero's Books (Peter Greenaway, 1991). Return to Oz (Walter Murch, 1985). The Seventh Voyage of Sinbad (Nathan Juran, 1958). Shrek (Andrew Adamson/Vicky Jenson, 2001). Siegfried [Siegfried, die Nibelungen] (Fritz Lang, 1924). Sinbad and the Eye of the Tiger (Sam Wanamaker, 1977). Spirited Away (Hayao Miyazaki, 2001). The Thief of Bagdad (Raoul Walsh, 1924). The Thief of Bagdad (Ludwig Berger, Michael Powell, Tim Whelan, 1940). Time Bandits (Terry Gilliam, 1981). Topper (Norman Z. McLeod, 1937). Wings of Desire [Der Himmel über Berlin] (Wim Wenders, 1987). The Wizard of Oz (Victor Fleming, 1939). Beauty and the Beast (1987-1990). The Heroic Legend of Arislan [Arisuran no Senki] (1991). Animated. Record of Lodoss War [Lodoss to Senki] (1990). Animated. The Vision of Escaflowne [Tenkuu no Eskafuroone] (1996). Animated. Wyrd Sisters (1996) and Soul Music (1996) [reissued together as Terry Pratchett's Discworld Collection]. Animated. Gaiman, Neil, The Books of Magic (DC, 1990-1991). Gaiman, Neil, The Sandman (DC/Vertigo, 1988-1996). Holguin, Brian, Aria (Image, 2000-2003). Moore, Alan, Promethea (America's Best Comics, 1999-2004). Nelson, Arvid, Rex Mundi (Image, 2003-2004). Pini, Wendy, and Pini, Richard, Elfquest (WaRP Graphics, 1981-1984). Sakai, Stan, Usagi Yojimbo (multiple publishers, 1984-2004). Smith, Jeff, Bone (Cartoon Books). Wagner, Matt, Mage: The Hero Discovered (Comico, 1984-1986). Wyman, Vicki, Xanadu. (MU, 1993, 1994). Barker, M.A.R. Empire of the Petal Throne (TSR, 1975). A new treatment of the same setting is Tekumel (Guardians of Order, 2004). Brucato, Phil, et al. Mage: The Ascension (White Wolf 2nd ed., 1995). Fantasy-relevant supplements to this epic game of modern magic include Phil Brucato's The Book of Crafts (White Wolf, 1996) and The Book of Worlds (White Wolf, 1996), and Dragons of the East (White Wolf, 2000) and Dead Magic (White Wolf, 2000), both developed by Jess Heinig. Brucato, Phil, et al. Mage: The Sorcerers Crusade (White Wolf, 1998). Crossby, N. Robin. Hârnworld (Columbia Games, 1990). Grabowski, Geoff, et al. Exalted (White Wolf, 2001). Halliwell, Richard, et al. Warhammer Fantasy Roleplay (Games Workshop, 1986). Laws, Robin D. The Dying Earth Roleplaying Game (Pelgrane Press, 2001). Long, Steven S. Fantasy Hero (Hero Games, 2003). Pearcy, Derek. In Nomine (Steve Jackson Games, 1997). R. Sean Borgstrom and David Edelstein's Ethereal Player's Guide (Steve Jackson Games, 2003) adds pagan gods and spirits to this religious fantasy. Perrin, Steve, et al. RuneQuest (Chaosium, 2nd ed. 1980). A new treatment of the same setting is Robin D. Laws and Greg Stafford's Hero Wars (Issaries, Inc., 2000). Simbalist, Edward E., and Backhaus, Wilf. Chivalry & Sorcery (Fantasy Games Unlimited 1st ed., 1977). The 4th edition is supported by Brittannia Game Designs, Ltd.
Stafford, Greg. King Arthur Pendragon: Epic Roleplaying in Legendary Britain (Chaosium, 4th ed. 1993); James Palmer et al. focus on fiefs and feudalism in Lordly Domains (Green Knight, 1999). Tweet, Jonathan, et al. Dungeons & Dragons (Wizards of the Coast, 3rd ed. 2001, 3.5 ed. 2003). Among the excellent supplements to Gygax and Arneson's classic fantasy RPG are Jeff Grubb, et. al's Manual of the Planes (1987, rev. ed. 2001) and Nigel Findley, et al. 's Draconomicon (1990, rev. ed. 2003). Tweet, Jonathan, and Rein•Hagen, Mark. Ars Magica (Atlas Games, 1996). Adam Bank and Jeremiah Genest's The Mysteries (Atlas Games, 2000) adds historical mysticism to this evocative medieval fantasy. Wujcik, Eric. Amber Diceless Role-Playing (Phage Press, 1991). Yee, Suzy, and Browning, Joseph. A Magical Medieval Society: Western Europe (Expeditious Retreat Press, 2003). Discworld Roleplaying Game. 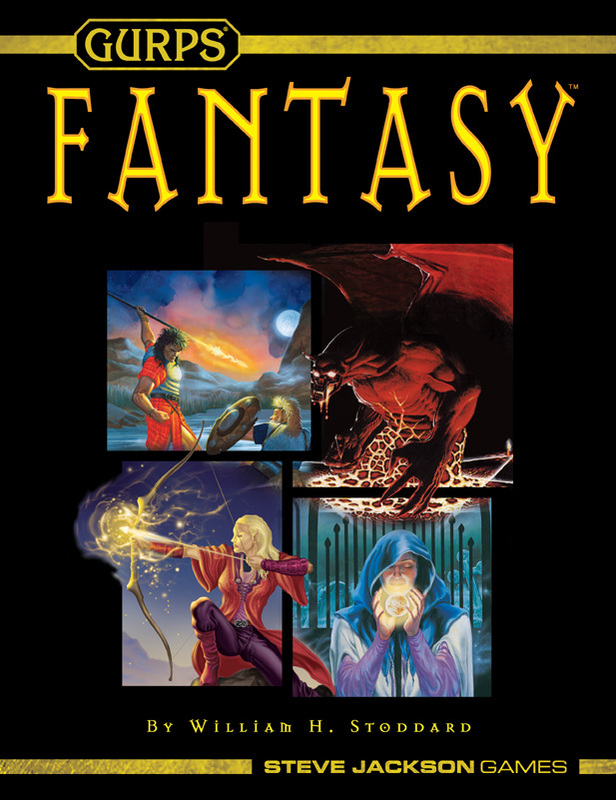 Stand-alone ("Powered by GURPS") RPG based on the humorous fantasy of Terry Pratchett. Released first as GURPS Discworld. Supported by Discworld Also. GURPS Cabal. Horror-conspiracy setting in which the Earth – in fact, the entire universe – is controlled by a secret alliance of powerful wizards and demigods. Contains a variety of alternate and modified magic systems. GURPS Celtic Myth. Britain and Ireland, from prehistory up to the 5th century, with special emphasis on folklore and myth. GURPS Dragons. Dragons and other serpentine and reptilian races, both as monsters and as civilized beings. GURPS Faerie. Dwellers "under the hill" and their cousins in folklore. GURPS In Nomine. Roleplay agents of Heaven or Hell, or pagan gods and spirits with no ties to either side. A GURPS treatment of extremely powerful supernatural beings as player characters. GURPS Magic Items 1, GURPS Magic Items 2, and GURPS Magic Items 3. Treasuries of magical artifacts. GURPS Places Of Mystery. Locales with mysterious or unusual histories, from all over the world and from every historical period. GURPS Shapeshifters. Beings that can change form, from werewolves to far-future constructs of liquid metal. GURPS Spirits. Entities that embody abstract concepts such as "nature" and "divine will." GURPS Technomancer. Alternate Earth where magic awakens in 1945, changing the world. GURPS Undead. The living dead – ghosts, mummies, wraiths, zombies, etc.